The lesser known automobile company, earlier owned by Bajaj Auto limited, Force Motors has been quietly developing a SUV for use in the Indian market. The company currently makes light commercial vehicles, three wheelers, buses, tractors, heavy commercial vehicles and multi utility vehicles. Earlier attempts by the Pithampur based manufacturer gave us the Trax, the Judo and Gurkha. All the three used the common Trax platform. It is rumored that the company even hired ace designer, Dilip Chabbria to design one of their so called concept Juggernaut however it didn’t take off. This vehicle was supposed to be on the lines of the Hummer. The new SUV that they are developing is more for a personalized mode of transposrt rather than the earlier commercial peoples mover that the company used to make. They have taken technological help from Lotus Engineering. The latter would help the company in honing the new SUV’s ride and handling. It is noteworthy that Lotus Engineering has also helped Mahindra and Mahindra in their earlier days with the Mahindra Scorpio SUV. The Force Motors Suv would also have tough competition in the form of the Tata Safari, Mahindra Scorpio and also the new SUV coming from Mahindra code named W201. The engine powering this new SUV would be a 2.2 liter engine which is to be made under license from Daimler Motors. Force Motors also assembles engines for the Mercedes E and Mercedes C class of passenger vehicles. Force Motors are also undergoing talks with other foreign agencies to reduce the NVH levels for their new SUV. Unfortunately none of Force Motors earlier ventures like the Traveller, Trax and the Minidor had a rural following and quite didn’t make it through the urban commuter. This time around, they want to make a big difference and for this very reason, they are planning on initially marketing this SUV as an urban vehicle and once its popularity increases, they would put it across to the rural areas as well. There would be an elaborate marketing campaign as well unlike other Force Motors products. The company have put in Rs.150 crores for this new project. This new SUV would be built in Pithampur which has an annual production capacity of 24,000 units. As per the company’s plans, this new SUV would be sold through the dealership network of 25 outlets. A new set of R&D as well as advertising people would also be selected from out of the range. For this very effect, the company has put along 11 prototype vehicles on the road for testing and all these cars have achieved about 30,000,00 kms. The company’s Managing Director Prasan Firodia said that all the hard work gone into the SUV has been paying off now with the powertrain and the C in C chassis sturdy enough for the term of the testing. Unfortunately none of these prototypes were tested in Mumbai but near the company’s Pithampur facility. This SUV is expected to be launched in India by February 2011. Following on the lines of the launch of this SUV, an urban MUV would also be launched which would compete with the likes of the Toyota Innova and the Mahindra Xylo.The MUV would be launched at around May 2012. It would have quality in the same ball park as the latter. Hmm.. the first picture if of the New Mahindra W201, premium SUV. 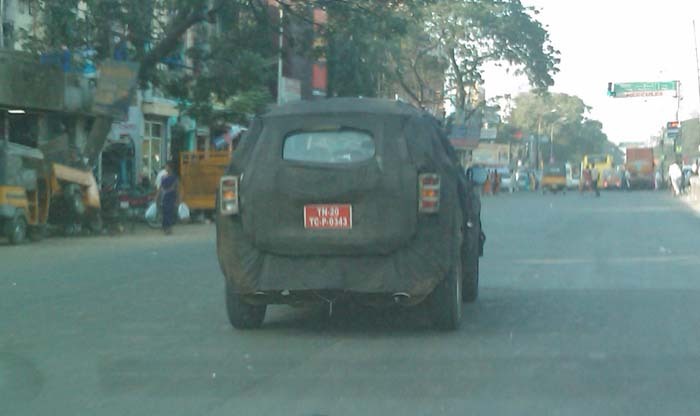 It’s very clear from the Twin Exhaust on both sides of the rear, and the Old Scorpio’s taillights. The second one too pretty much looks like it. 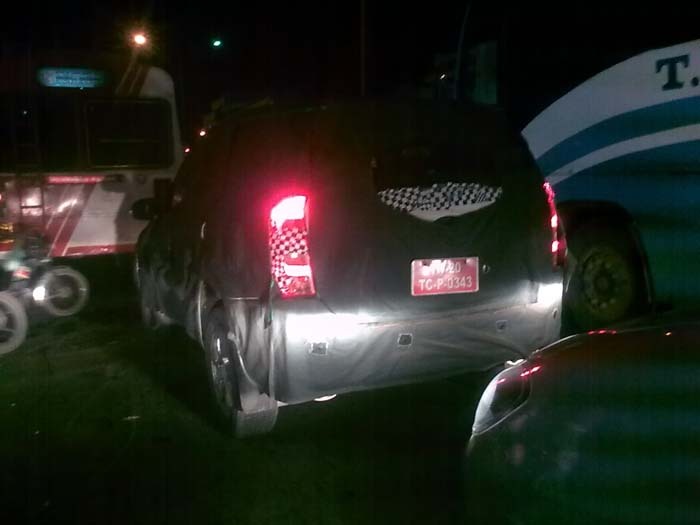 It doesn’t seem to be the Force SUV, which is based on the Foday Explorer.